All bees belong to the order Hymenoptera. Although both honeybees and bumblebees buzz, eat pollen from flowers, and sting when they're mad, they're also different in many ways. Bumblebees and honeybees are separated by a few key characteristics, namely their taxonomic place in the animal kingdom, their appearance, their habits, and where they live. Both bumblebees and honeybees are classified in family Apidae, but are separated into the genera Apis and Bombus. The genus Apis contains four honeybee species -- the common or European honeybee (Apis mellifera), the dwarf honeybee (Apis florea) the giant honeybee (Apis dorsata), and the Oriental honeybee (Apis cerana). About 250 species are classified in the Bombus genus. Some common species include the buff-tailed bumblebee (Bombus terrestris), Franklin's bumblebee (Bombus franklinii), Morrison's bumblebee (Bombus morrisoni), and the brown-banded carder bumblebee (Bombus pascuorum). Honeybees are smaller than bumblebees. Honeybees have two sets of clear wings, with the front set larger than the back set. Honeybees have no stripes on their thorax, or the body segment between the head and the abdomen. With so many different species, there's much more variety in what bumblebees look like. In general bumblebees have thicker, rounder abdomens than honeybees. They're also quite fuzzy and have no distinct waist between the thorax and abdomen as honeybees do. 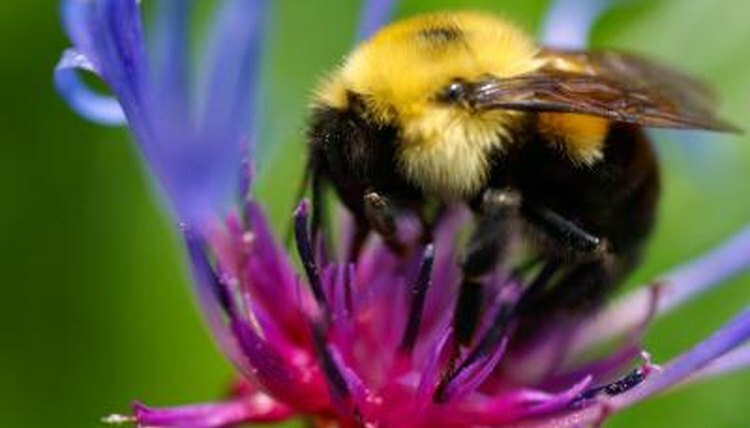 Bumblebees come in several color variations. For instance, Bombus pascuorum is covered in tawny-colored fur instead of black and yellow stripes. Honeybees can communicate to each other in complex ways to help them complete their honey-gathering work. For instance, they use elaborate dances to tell other workers where good supplies of pollen can be found. Bumblebees also forage nectar from flowers and bring it back to the hive to share. They produce honey that is stored in the nest, but the amount produced and stored is so small that it wouldn't be profitable to domesticate bumblebees the way honeybees have been. Bumblebees mark flowers they've visited so they know where a good group of them are but don't waste time visiting individual blooms that have already been harvested. Bumblebees learn to harvest pollen from different types of flowers and can become specialized in extracting from different plant species. Honeybees build complex hives to house thousands of bees in one colony. Undomesticated honeybees make their hives in hollow trees. When the hive becomes overcrowded, the oldest queen leaves with a swarm of worker bees and finds a new home. Among honeybees the entire colony survives the winter. Bumblebees also live in social colonies, but they make their home in places like burrows or debris piles. Different bumblebee species will prefer either above ground, surface or below ground nesting. At most, bumble bee colonies contain a few hundred members. The queen is the only hive member that survives the winter. She is responsible for regenerating the entire colony in the spring. Honeybees originate from Europe, Africa and the Middle East, but have been spread to every continent except Antarctica. They live everywhere except the very furthest northern and southern latitudes. Bumblebee species are found in North America, South America, Asia and Europe, but are not represented in Australia or the Antarctic, and live only in the northern margins of Africa. They've also been introduced to New Zealand. What Kinds of Ants Live in Africa?